In the world of photography, the iPad has become an equal partner in my gear bag. Among the many reasons I like it so much are that the apps are affordable, easy to use, and targeted to specific functions. Just like everyone else, I have my favorites. And I'd like to know yours too. 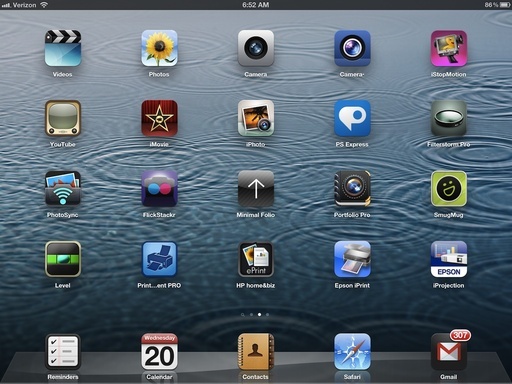 Are any of these on my list of 5 favorite iPad apps? You bet! iPhoto for iOS - Terrific all-around imaging app that interacts well with the Apple ecosystem. iStopMotion for iPad - Recording and managing time lapse movies has never been easier or more fun. PhotoSync - Even though I use iCloud and like it, sometimes I just want to "send this photo to this device" right now. PhotoSync does that easily and quickly. iA Writer - For me, this is the best note-taking app on the planet. Clean, functional, easy to use. And it interacts with iCloud so my documents are up to date all the time on all iOS devices. Reminders - I've tried many "ToDo" apps, but in the end, Reminders works the best for me because of its deep integration in iOS and iCloud. So what are your current five favorites? Post them in the comments if you want to share. Just wondering what your workflow looks like when using iPhoto in relation to Aperture/LR that sits on your computer in the studio - do you import only certain images to iPhoto for iPad? Do you sync edits you make with iPhoto with your Aperture library? Thankbyou for writing up your favorites. I think I agree with all of them. Due Wonderful quick reminder and egg timer app that syncs between my iPhone and iPad. Adding new a new reminder or timer is super quick and you can recycle previously completed tasks. You can set automatic reoccurrence and there's auto snooze in case you miss the first alert. iReconcile Checkbook app that allows syncing between me, my husband, & my iPad. Top Camera Camera replacement app that includes HDR BA d slow shutter options as well as basic editing and filters. My favorite feature is that you can set it to always open to the camera no matter where you left off in the app so I don't miss a picture. Snapseed Easy to use photo editing. Great filters and I love the spot adjustment for if you just need to adjust certain areas of the photo. Waze Free turn by turn navigation.